Several hours later I decided to take a gamble on the all too unpredictable British Summer and hedge my bets on a spell of warmer weather ahead, with some ice cream. 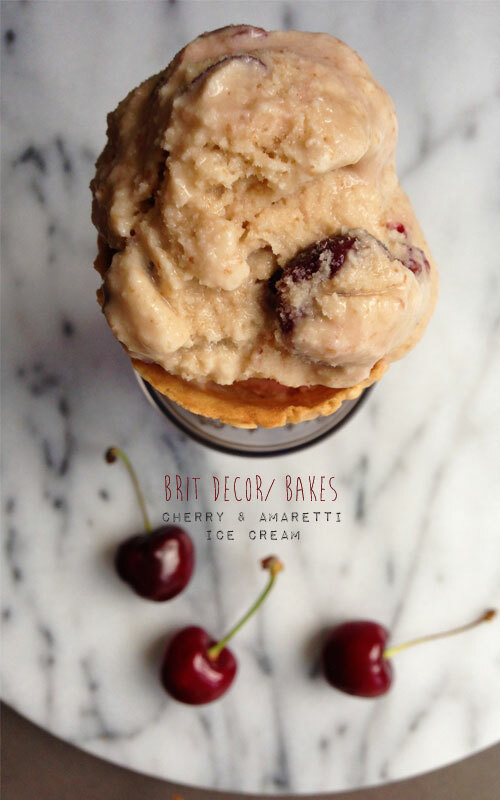 I just so happened to have a bag of Amaretti biscuits crying out to be used and I knew that their distinctive Almond flavour would be the perfect match for the cherries and bring some texture to the ice cream. I guess it's therefore rather fitting that today should be a gloriously warm and sunny day here in the UK! 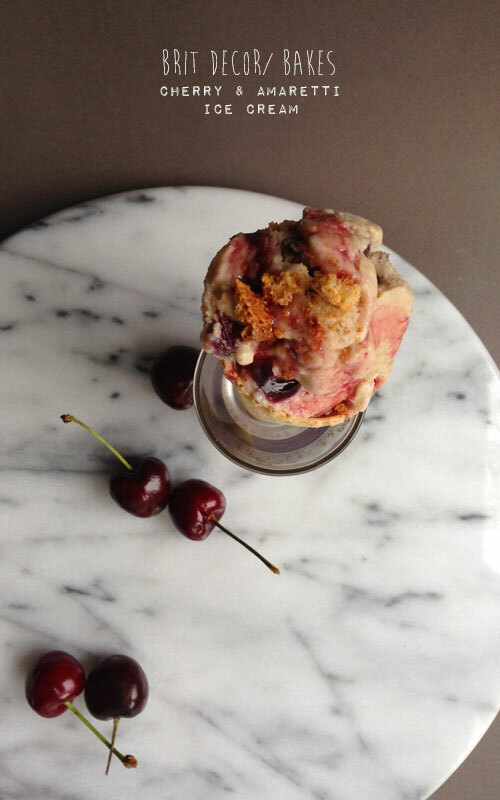 You will ideally need an ice cream maker for this recipe. Begin by beating together the egg yolks and sugar, then add the milk and place into a saucepan on a low heat (it's important not to boil this). As the mixture slowly thickens into a custard, remove from the heat and allow to cool. Meanwhile, place the cherries into a pan along with 50ml of water and the caster sugar - cook until softened. Then pop the cooked cherries into a blender and allow to cool. 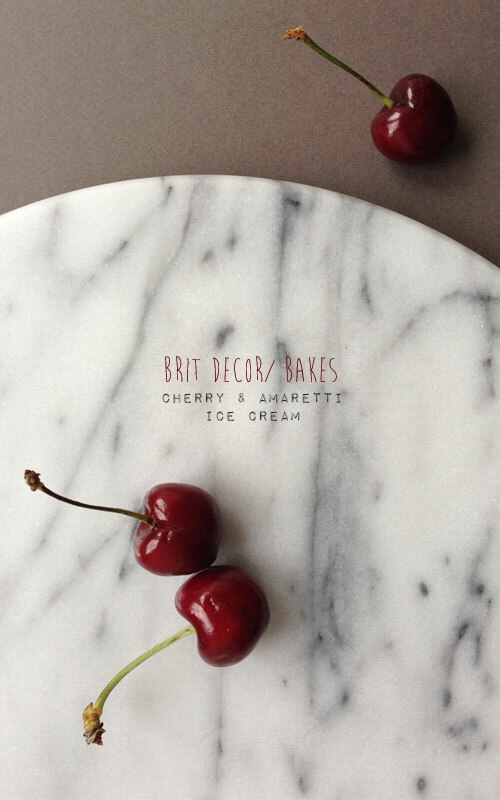 (I kept back the cherry juices from the saucepan to refrigerate and use as a topping for the ice cream). Then crush a handful or around 100g of Amaretti biscuits and place to one side. In a separate bowl, whip the cream until light and fluffy. Add the cooled custard, the chopped cherries and the crushed Amaretti to the whipped cream before placing in the ice cream maker. Once frozen, serve with the optional extras of some additional finely crushed Amaretti and/or some of the cherry juice saved earlier.